Tune in to see B on the G…4!!! Yupâ€¦you read right. For all those Nintendo-heads swarming our little sanctuary around the time of E3 â€“ resulting in the untimely desecration of our original Fan Forum â€“ itâ€™s time to strike back! 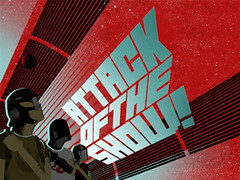 I’m heading down to G4â€™s LA hq today to appear live on their pop-cult program â€˜Attack of the Showâ€™, where â€“ aside from some shameless DVD pimping and general saintly soapboxing â€“ some game-related news might finally slip the seals. Millions of folks in the US are dialed in to G4 (seriouslyâ€¦some donâ€™t even KNOW they are! ), so click the linkie above for scheduling and repeats in your area, and make sure youâ€™ve got a tape in the old-fangled video cassette recorder doohickeyâ€¦you know, the dusty black thing you stack books onâ€¦beside the X-Boxâ€¦and behind the TiVo. Daggumit! This entry was posted on Tuesday, August 16th, 2005 at 10:36 pm and is filed under Uncategorized. You can follow any responses to this entry through the RSS 2.0 feed. You can leave a response, or trackback from your own site.